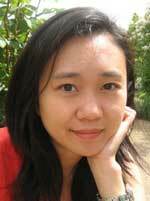 Jennifer Chang was the 2005 Van Lier Fellow in Poetry at the Asian AmericanWriters’ Workshop and the 2005 Louis Untermeyer Scholar at the Bread Loaf Writers’ Conference. Her poems have appeared in Barrow Street, GulfCoast, Indiana Review, New England Review, Best New Poets 2005, and other publications. She lives in Charlottesville with her husband, the poet Aaron Baker.